This executive summary shares highlights from recent research completed by Nadine Manjaro, a trusted Compass Intelligence partner and expert in the field of Artificial Intelligence. Artificial Intelligence (AI) and Internet of Things (IoT) are closely aligned since IoT is largely about collecting data from assets, analyzing the data to gain insight, taking action, and creating value. AI is about organizing and making sense of structure and unstructured data in an automated, self-learning context. Many companies are now realizing that data is critical to the survival of their businesses as technology and how people use information changes. Many of the largest companies have an IoT and AI strategy. This paper is focuses on the use of artificial intelligence to improve business operations and the resulting opportunities. 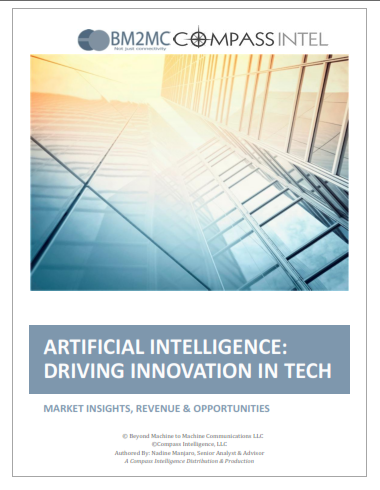 Contents include AI Talent Acquisition, 14 vendor profiles, AI Pricing Parameters, Revenue Flow, Opportunities, Use Cases, List of AI Experts, Investment Areas in Chipsets, The CompassIntel A-List in AI Chipset Index, and more. This executive summary is complimentary. Please fill out the below form for immediate download. Please fill out the below form to get access to the Executive Summary.